Regulatory differences across jurisdictions can be costly for traders. While these costs may reflect variations in domestic conditions and preferences, they may also be the result of rule-making processes working in isolation and of a lack of consideration for the international environment. Thus, some of the trade costs of regulatory divergence may be avoided without compromising the quality of regulatory protection. Building on lessons learnt from OECD analytical work and the experiences of OECD countries in regulatory policy and trade, this report proposes a definition of trade costs of regulatory divergence and analyses various approaches to addressing them, including unilateral, bilateral and multilateral approaches. It focuses on the contribution of good regulatory practices, the adoption of international standards, and the use of cross-border recognition frameworks and trade agreements. Based on this, the report provides indications for policy makers on how to reduce trade costs through international regulatory co-operation. 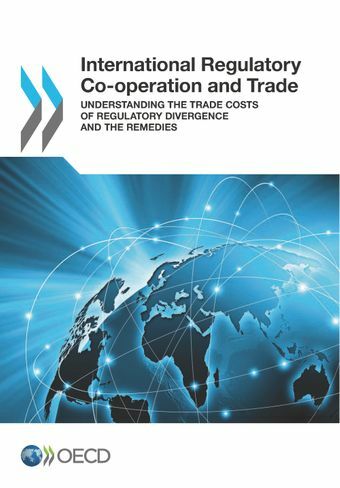 This report synthesises work carried out by the OECD Regulatory Policy Committee and the OECD Trade Committee on understanding the trade costs of regulatory differences and addressing them through international regulatory co-operation. It is a topical issue. Recent international trade negotiations therefore put an emphasis on promoting greater interoperability for businesses operating in countries with varying regulatory requirements. The analysis shows that trade costs may arise from unintended regulatory heterogeneity across jurisdictions, including information, specification and conformity assessment costs. Evidence on the magnitude of these trade costs remain largely unknown, although they are likely to vary significantly by sectors. Greater understanding of the trade costs of regulatory divergence could usefully inform the rule-making process. Regulatory impact assessments (RIA) provide a useful vehicle for this. The report shows that policy makers can draw from a wide range of approaches to address the trade costs of regulatory divergence, including unilateral, bilateral and multilateral. It draws a preliminary list of considerations to reduce trade costs through IRC. It identifies the generic measures that countries can take that promote regulatory quality and trade. It highlights the considerations that can drive the selection of specific IRC approaches. For further information, please contact Céline Kauffmann, Regulatory Policy Division, OECD.